How do I get an HVAC License in New Jersey? Beginning March 1st, 2014, the State Board of Examiners of Heating, Ventilating, Air Conditioning and Refrigeration Contractors began accepting applications for licensing now required under N.J.S.A. License Law (Act). The Act, originally established in October of 2011, sets forth revised standards to regulate the practice of professional HVACR Contractors. As a part of this new Act, applicants must demonstrate that they have completed the requisite education and passed the Board’s licensing examination. Requisite education under the Act includes a bachelor’s degree in HVACR (or related field) or five years of employment in the HVACR contracting business, which must be satisfied before receiving Board approval to sit for the licensing exam. To apply, applications must be completed online, and include a $100 application fee. Other fees include a licensing fee of $160, a $25 fee for the issuance of a pressure seal, and a licensing renewal fee of $160 due every two years. However, for a limited time, currently practicing HVACR Contractors may apply for the license based upon experience without examination. The option is only available until September 1st, 2014. Individuals eligible to qualify through grandfathering must have engaged in the practice of installing, servicing, and maintaining HVACR systems for at least two years. This may be demonstrated by submitting a “Grandfathering” application along with the appropriate fees and the contractor’s own notarized attestation of the requisite experience, including proof of certifications, education in the field, employment history, a form W-2, and/or any other relevant documentation serving to support the contractor’s professional practice. This offer is not only extended to New Jersey contractors! 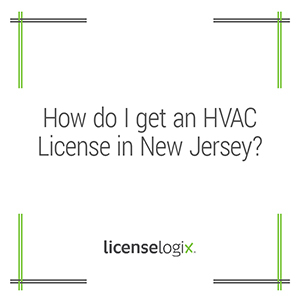 If another state has licensure standards equivalent to those in New Jersey, and allows reciprocity to New Jersey licensed Master HVACR Contractors, then professionals licensed in that state may also qualify through grandfathering without taking the license examination until the September 14th deadline. After that date, all contractors must apply through the regular licensing and examination process, and shall not be permitted to perform HVACR services unless licensed pursuant to the Act. Don’t delay and risk subjecting yourself to unnecessary examinations and fees. Our skilled Account Managers will seamlessly navigate the filing process on your behalf. If you are already licensed, we can manage license renewals and ongoing license compliance. To get started, click here or call us today at 800-292-0909.